Earlier this month, the first trailer for Netflix's new series Stranger Things debuted, ahead of the full first season debuting globally on the streaming service starting next month. With the premiere just a few weeks away, today we have a new poster and yet another trailer with even more footage, which delves deeper into this supernatural mystery that rocks a small Midwestern town. 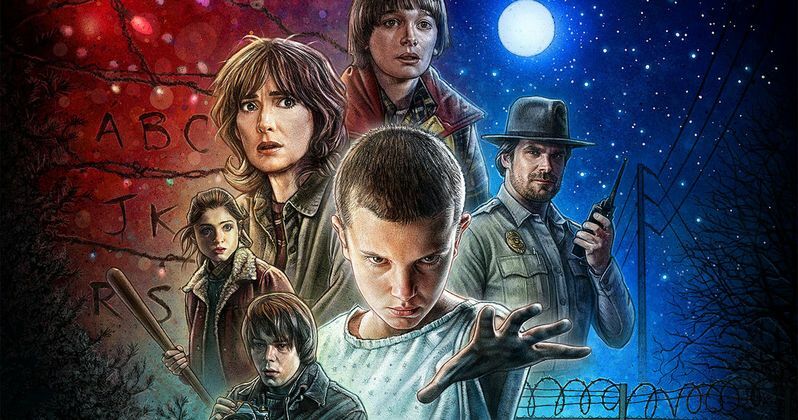 If you've been looking for a new show to binge-watch this summer, and can't get enough of the 1980s, then Stranger Things will surely be right up your alley. An innocent night playing Dungeons & Dragons takes a tragic turn for a group of friends in Hawkins Indiana when Will Byers disappears...seemingly into thin air. The year is 1983 and this small town is abuzz with conspiracy theories behind the missing boy's circumstances. As friends, family and local police search for answers behind his disappearance they are drawn into an extraordinary mystery involving top-secret government experiments, terrifying supernatural forces and the discovery of one very strange little girl. Her appearance and powers appear super human and the boys begin to understand that she might have a sinister connection to their missing friend. With the debut of an impressive young breakout cast (Finn Wolfhard, Gaten Mattarazzo, Caleb McLaughlin and Millie Brown as Eleven), Stranger Things is a love letter to the ubiquitous cult classics of the 80's. All episodes debut globally on Netflix Friday July 15th. Stranger Things stars Winona Ryder (Joyce Byers), Matthew Modine (Dr. Brenner), David Harbour (Chief Hopper), Charlie Heaton (Jonathan Byers), Natalia Dyer (Nancy Wheeler), Millie Brown (Eleven), Finn Wolfhard (Mike Wheeler), Caleb McLaughlin (Lucas Sinclair), Gaten Matarazzo (Dustin Henderson), and Cara Buono (Karen Wheeler). The supporting cast also includes Noah Schnapp (Bridge of Spies). The new drama series written and directed by Matt Duffer and Ross Duffer (Wayward Pines, Hidden) consists of eight, one-hour long episodes. The Duffer Brothers are writing, directing and showrunning the series, and will serve as executive producers along with Shawn Levy and Dan Cohen via their 21 Laps entertainment banner (The Spectacular Now, Night At The Museum, Real Steel, Date Night). Stranger Things is a Netflix production. We'll have to wait and see if Stranger Things will be the next hit series to debut on the popular streaming service. Take a look at the trailer and this 80s-style poster below, and stay tuned for more on Stranger Things.